Have you ever imagined tasting a paella made by you? Well, this is your chance to learn how to cook the most famous Spanish dish at our Cooking Class Madrid. An experienced chef will teach you all the secrets of an authentic Spanish Paella. So when you are at home and miss Spanish food, you can cook it yourself. This will give you also a big chance to impress your friends and relatives with your Spanish cuisine skills. In the Cooking Class Madrid you’ll cook paella and other kind of Spanish tapas (depending on the pack you choose) also you’ll learn how to make a tasty sangria, but the best of all, is that after and your group finish to prepare everything you will eat it all! 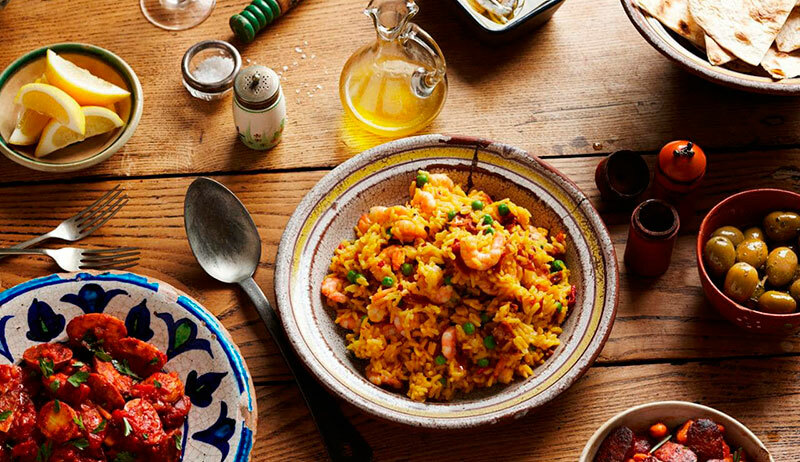 Hearing the words “paella” and “sangria” you think about Spain, don’t you? That yellow delicious dish what you see serving in almost all of the restaurants in Spain. The real Spanish paella is the Valencian style paella that includes rabbit, chicken, saffron, beans and rice but there is plenty kind of paellas. The most traditional one has chicken, saffron, seafood, vegetables and rice. Sangria is a cocktail of wine with different kind of preparations as adding to it fruits and other kind of alcoholic drinks. It is based on red wine (generally on a young one), added to it juice, sugar and different kind of fruits as orange, apple or/and lemon but everybody can compliment it with anything they want. But this is not all… At our Cooking Class Madrid you will also learn how to make the typical Spanish drink: sangria. Cooking Class Madrid will test your cooking skills and it is also a great team building activity, so your group can cook and eat your own paella, and of course, drink your own sangria.